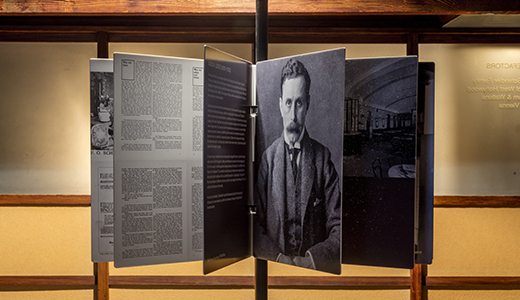 a l m project was invited by the MAK Center for Art and Architecture to design the exhibition R. M. Schindler: The Prequel, curated by Christian Witt-Dörring. 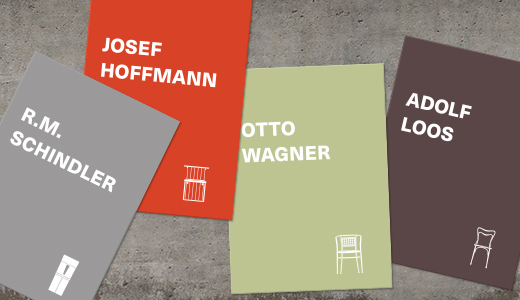 The exhibition charts lines of influence that connect R. M. Schindler (1887–1953) with his mentors Otto Wagner (1841–1918), Josef Hoffmann (1870–1956), and Adolf Loos (1870–1933) – three giants in the evolution of Viennese modernism, and each an inspiration to Schindler: Wagner as a proponent of Nutz-Stil, or “utilitarian style,” privileging function over form; Hoffmann with his development of an abstract geometric visual language; and Loos with his emphasis on space and his commitment to deriving spatial plans from the needs of inhabitants. 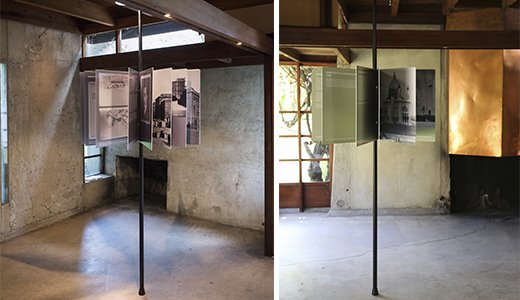 For a l m, the challenge was to conceptualize an installation comprising few artifacts and largely focused on a narrative supported by historical images of the architectural works of Schindler and his mentors. 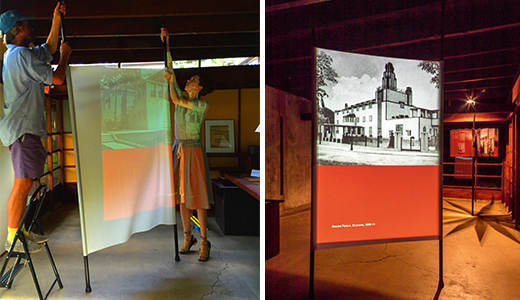 The exhibition is built around two modes of experience, with images translated into physical objects in their own right: one in which the images and text are explored by visitors turning pages of a dynamic, multi-leaved column; and another in which they are received in an ambient audio-visual projection featuring actress Katie Butler reading the narrative. 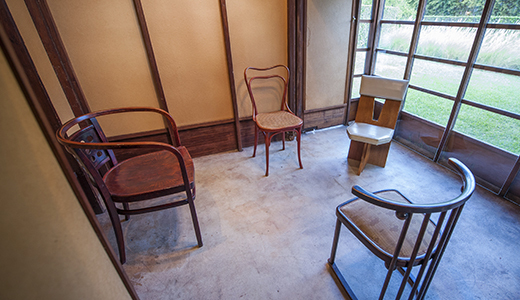 The visitor’s itinerary begins with a room in which four chairs designed by Schindler, Wagner, Hoffmann, and Loos are positioned in conversation with one another as iconic and tangible evidence of their respective visions. 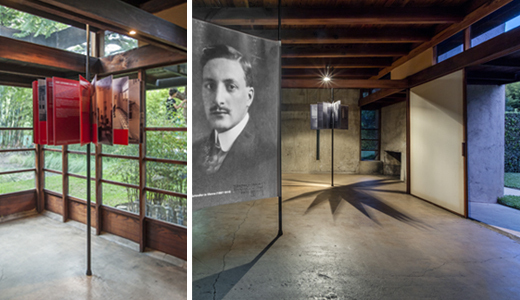 The installation unfolds across four more rooms, each devoted to a single architect whose identity is subtly referenced by the color most characteristic of his work – a reference echoed in ephemera produced to accompany the exhibition. 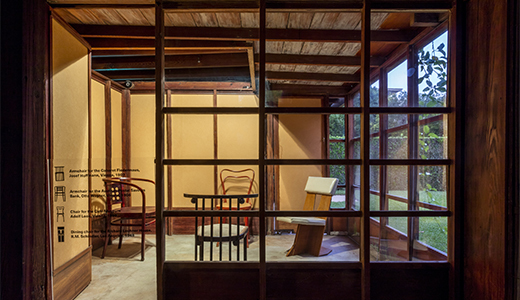 Aligned with the signature glass slot windows and glazed openings of the Schindler house, the rear-projection screens of a l m’s installation illuminate each space, capturing and focusing light the way the house itself does. Swing panels are mounted on a spring-loaded pole system originally designed by Lenardin Madden for A Little Joy of a Bungalow (October 17, 2013 – January 5, 2014). 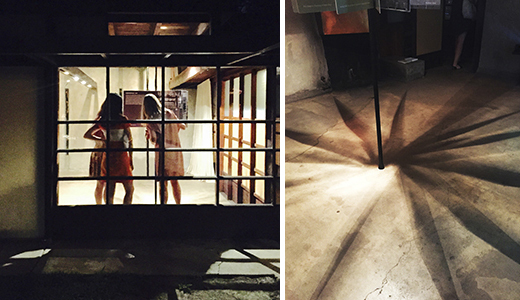 On view at the Schindler house, 835 North King’s Road, in Los Angeles, September 10 through December 6, 2015.